Here at KnitOasis Central, we've been hard at work preparing some lovely knitting indigo kits for sale at SAFF, The Southeastern Animal Fiber Fair. Every year, farmers, yarn merchants, spinners, dyers, and assorted crafts people and small business owners gather to teach, learn, compete, share, mingle and more at the Western North Carolina Agricultural Center in Fletcher, NC. Last year I made it for one day and was so impressed with the atmosphere of creativity and camaraderie. There was so much to see and do and buy. I will get to see lots of lovely folks that I only ever see at events like this. 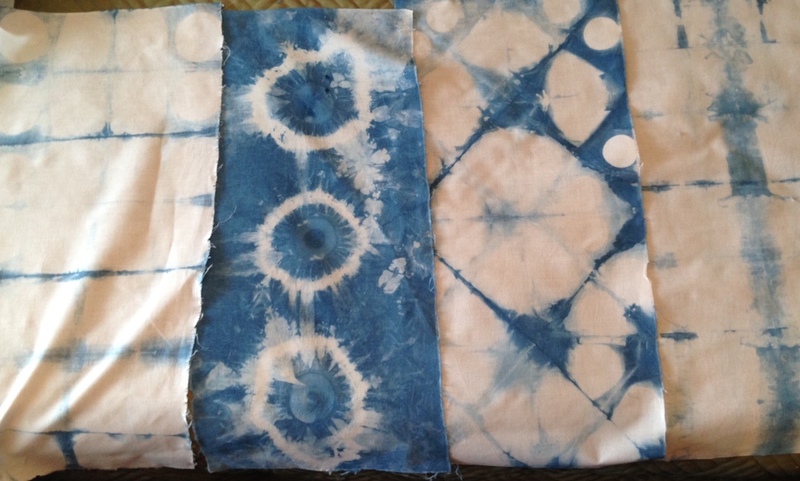 I'll have the chance to show off some indigo, talk about indigo, and hopefully, sell some indigo kits! This amazing fabric will be lining for hand-knit bag kits. I love it all so much, it's kinda hard to part with any of them! Are you going to be at SAFF this year? If so, please come see me! No trip to any event is ever complete for me without seeing folks I know and making new friends. Heck, that also applies to going to the grocery store! Please stop by and say hello. If we've yet to meet in person, all the better. I can't wait to see you all! I'll have two kits available: The Charleston Indigo Scarf kit (includes pattern and 500 yards of 100% cotton yarn, hand-dyed with natural indigo) and the Indigo To-Go Accessory Bag kit (includes pattern, zipper and 100% cotton yarn and fabric, both hand-dyed with natural indigo). The bag is a brand new pattern and will be available for the first time at SAFF! 100% cotton, 100% natural indigo, 100% special. Then on a recent trip I borrowed a set of size 9 circular needles. They were metal, but I was desperate. I used them for a day on a scarf, then transferred the stitches to a holder to return the needles, knowing I would be much happier when I got home to my bamboo needles and could finish the project with them. Imagine my shock when I was not happier. The difference in the stitch gauge and tension was freaky. It was flat out ugly, which, in a project using high quality luxury yarn*, you reallllyyyy don't want to see. Can you see the bit in the middle, where it's not as smooth and lovely? Sadly, knit with my bamboo needles. I have heard over the years that knitters who prefer to knit fast use metal needles of some kind, almost exclusively. As I've told my kids since they were small, though, it's not a race--at least not for me. I knit for enjoyment (even when I knit for business) and if I take all the fun out of it by racing against the clock or some other knitter, then I may as well take up Nascar (not. ever. happening.). The warmth of bamboo and the feel of something from nature have always been more important to me than speed or even cost. It turns out that the thing that trumps all the other issues is how good (or bad) your garter or stockinette stitch looks. All of this means that I broke down and bought a set of circular needles--the Options Interchangeable Nickel Plated ones from KnitPicks. I love how my knitting looks when I use them (which is all the time now) and I also love how the tips will stay sharp (bamboo has a tendency to lose some pointy-ness over time). My point (heh, heh) is that sometimes it helps to try new things and to be open to change. I think I may drive my family a tiny bit crazy, always trying to improve things and make things better/cleaner/more organized/more cost effective/more efficient. (Don't ask them about how I tried to re-invent Christmas last year. They aren't really ready to talk about it yet. It's still too fresh.) Some improvements work out though, and those are the ones that give me hope. I love how my knitting is looking with both my new Nickel Plated and my new Sunstruck Wood. I'm no longer strictly a Bamboo Girl. And I'm ok with that. *high quality luxury yarn = LYDIA Yarn. It's wonderful!